Readers may have recognised this 12 August letter to the FT from Mr Keetch as a variant made popular by email chain letters and time-sink Facebook devotees. 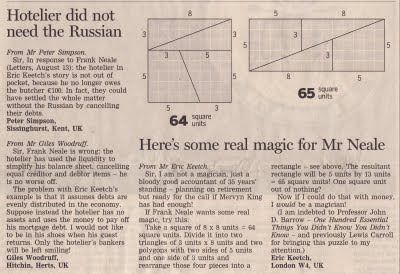 FT readers may have taken it a shade too seriously, though, judging by Friday's letter page below. But at least Mr Keetch remains one step ahead with his latest missive. Unfortunately, having chewed up and been poisoned by David X. Li's magical Gaussian copula, financial engineers at investment banks may already be looking at ways to commercialise this latest (old) conundrum. The solution (and I write under instruction from an infuriatingly quick friend) is that the rearrangement does not fit together snugly. For that one would have to divide by 3.0557 and 4.9443 rather than 3 and 5. And the gap covered by the rounding and thick line work is a tidy 1 unit.